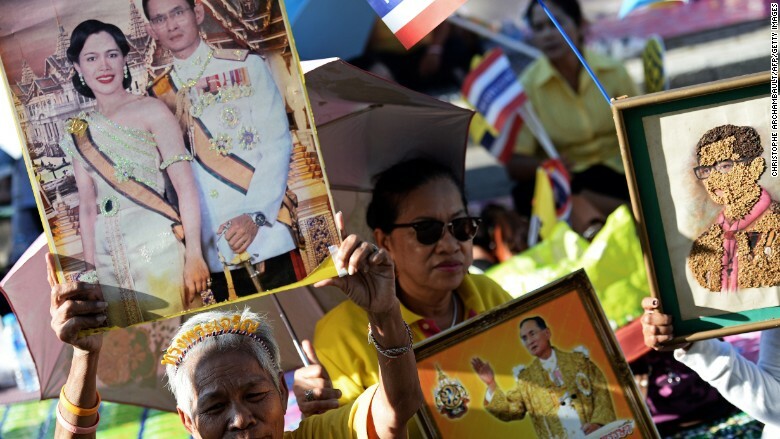 A crowd holds pictures of Thailand's king and queen, the country's revered monarchy. The international edition of The New York Times wasn't printed Tuesday in Thailand. The New York Times' local printer refused to produce the paper because the edition contained a story it deemed too sensitive to print, the newspaper said in a letter to readers. Thailand has strict lèse-majesté laws, which make it a criminal offense to insult the country's revered monarchy. The offending story, written by Times journalist Thomas Fuller, examines the future of the monarchy. The health of Thailand's current leader, King Bhumibol Adulyadej, has been a recurrent concern as he has spent most of the past five years in the hospital. The story also describes the crown prince in a way that could be considered unflattering. The article "is criticizing the Thai king so we decided not to print it," said a sales department employee at the printing company, who asked to remain anonymous. The company decides on a daily basis whether it will print based on an early newspaper draft, the employee said. The Times (NYT), in its letter, said the decision was "made solely by the printer" and was not endorsed by the newspaper. The online version of Fuller's story is still accessible in Thailand. "The International New York Times was not printed in Thailand because it includes an article that our locally contracted printer deemed too sensitive to print," a Times spokeswoman told CNNMoney. "This decision was made solely by the printer and is not endorsed by The Times." The Times has faced similar issues with its printing partners in the past. In May 2014, a local printer in the United Arab Emirates declined to print the paper because it contained material the company deemed sensitive. The paper is "published in some regions by franchisees and other partners who ultimately control what is distributed in their markets," Richard Stevenson, a top editor at The International New York Times, said when asked by the paper's public editor about the 2014 incident. "In the cases where we in the Times newsroom are informed ahead of time, we object to any decision to withhold or censor our work and make clear that doing so violates our principles." In 2013, the Thai navy brought criminal defamation charges against two journalists -- one Australian, one Thai -- accusing them of knowingly publishing false information and committing slander for reporting on the alleged involvement of the country's naval forces in human trafficking. The pair faced seven years in jail, but were acquitted earlier this month.